Another beautiful sunrise at Picnic Road. 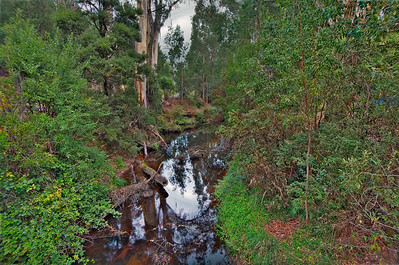 This is a panorama from photos I took with my iPhone, and processed in Lightroom, Photoshop, etc. This is the entry/exit point where the walk through Tunnel Creek starts and ends. Such a magnificent place. 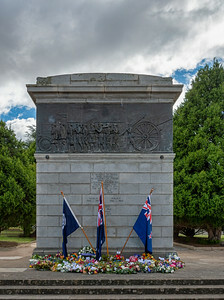 SS Maheno was an ocean liner belonging to the Union Company of New Zealand that operated in the Tasman Sea, crossing between New Zealand and Australia, from 1905 until 1935. She was also used as a ship by the New Zealand Naval Forces during World War I; as His Majesty's New Zealand Hospital Ship No. 1. 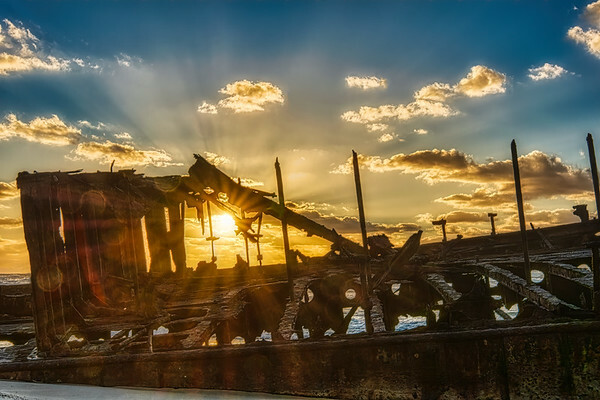 She was washed ashore on Fraser Island by a cyclone in 1935 where the disintegrating wreck remains as a popular tourist attraction. 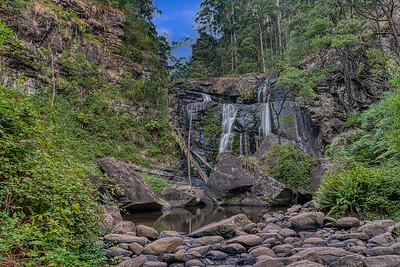 Located in the Otway National Park on the south coast of Victoria, Stevensons Falls is located around a five minute drive from the small town of Barramunga. 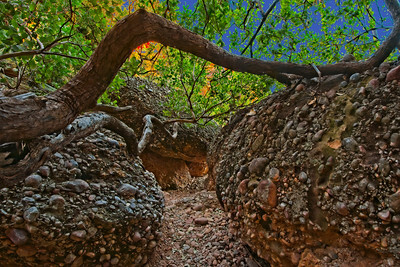 There are so many beautiful boabs in the Kimberley. 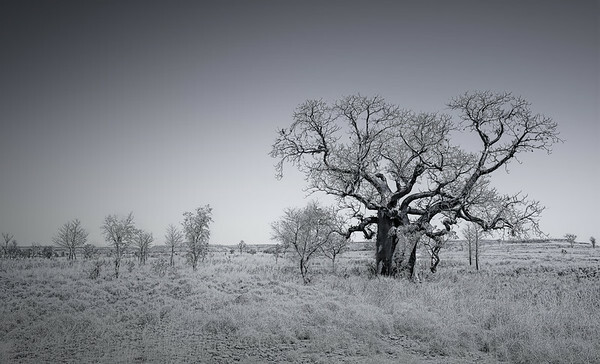 Here is one processed in Topaz Studio. 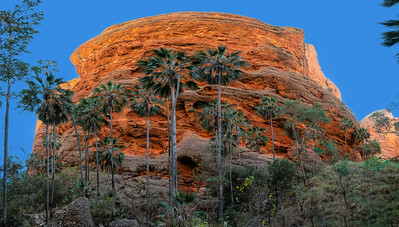 Another panorama of the amazing Bungle Bungle. 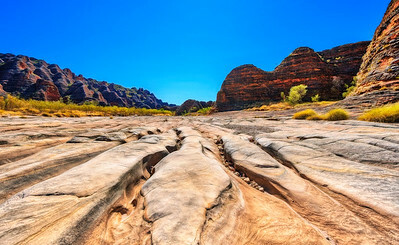 This is a seven photo panorama, processed in Photoshop, Topaz Studio and Landscape Pro. 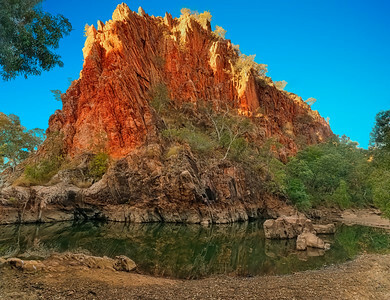 Sawpit Gorge is a picturesque waterhole near Halls Creek in the Kimberley region. 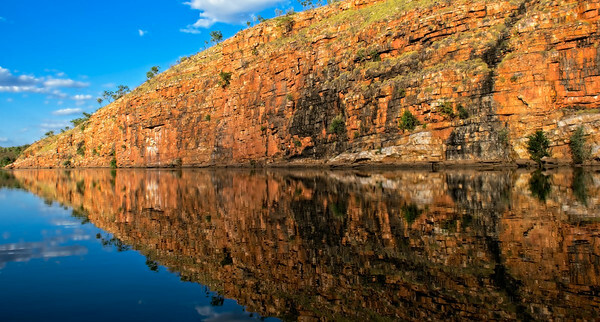 The gorge is located on the Black Elvire River where flood waters have cut through a range. 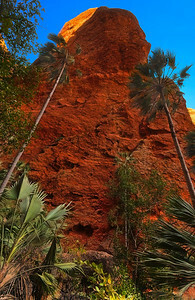 There is a towering rock wall on one side and sandy shaded banks. 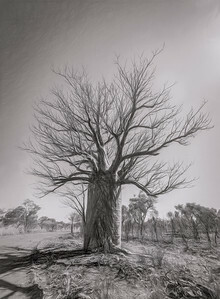 This is a composite photo I played with. This young man's action made me realise why they send young men to war. It's because they think they are invincible and immortal. 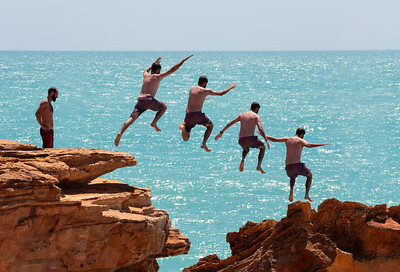 This group of young men were jumping of the cliff here into a pool full of rocks, without even thinking about it. 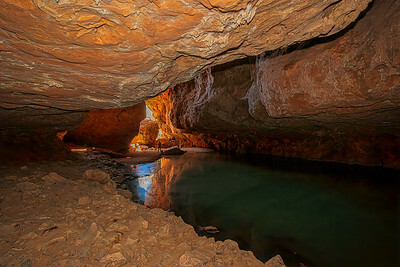 Another photo of the walk through Tunnel Creek, on the Gibb River Road. 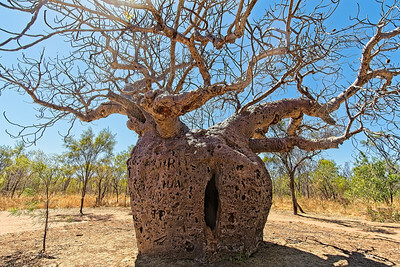 The Boab Prison Tree, Derby is a 1,500 year old, large hollow Adansonia gregorii (Boab) tree 6 kilometres south of Derby, Western Australia with a girth of 14.7 metres. 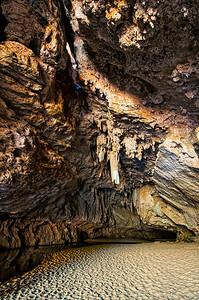 It had been reputed to have been used in the 1890s as a lockup for indigenous Australian prisoners on their way to Derby for sentencing. 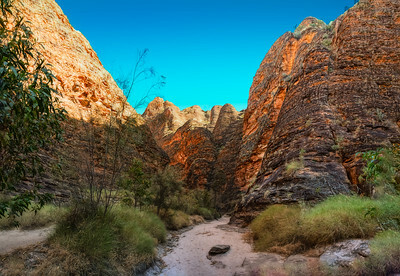 This is a 14 photo panorama of Wolf Creek Crater, processed in Lightroom and the new Luminar 3. 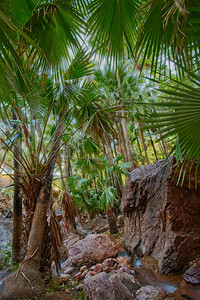 The Mini Palms Gorge walk at the Bungle Bungle is a beautiful steep walk amongst Livistonia palm trees. 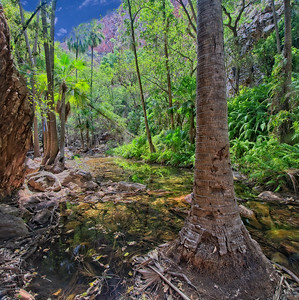 The beautiful El Questro Gorge on the Gibb River Road. 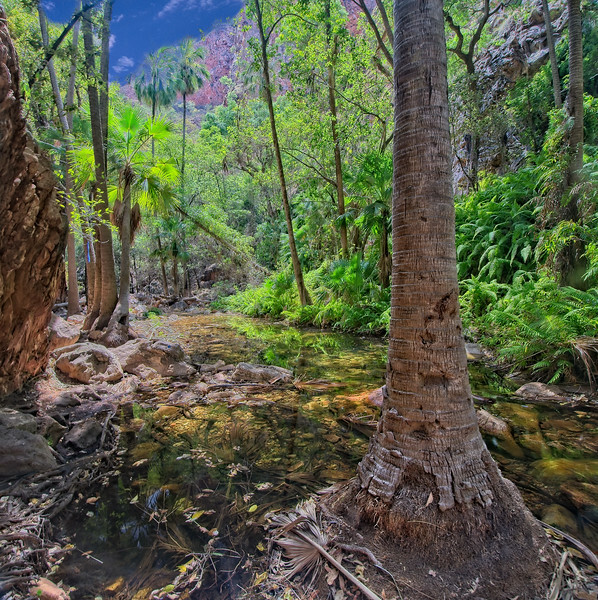 The beautiful Zebedee Springs at El Questro. 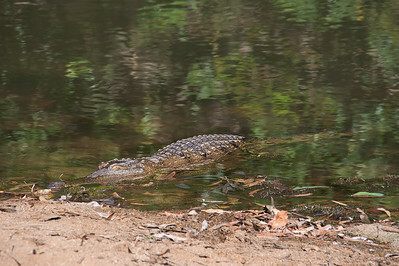 This is another photo taken while cruising on Chamberlain Gorge at El Questro.